Music was a big part of writing this book! It begins with Laura Mam’s “Pka Proheam Rik Popreay.” She’s a Cambodian-American singer from California and now Phnom Penh and sings in Khmer. I don’t speak Khmer, but I listened to her music a lot while I wrote, and her singing crosses cultures and languages.Here’s a playlist I put together with the help of Rosa, Sofie’s friend. It includes Laura Mam and the old Springsteen song, “Drive All Night” that Johnny sings to Sofie when he can’t tell her how much he loves her and wants her safe. And “Spanish Dancer” by Patti Scialfa recently recorded by EmmyLou Harris. And “Echo Taps,” played the way I heard it played by buglers at the New Hampshire State Veterans Cemetery. 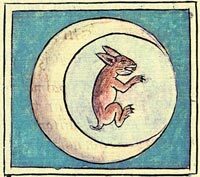 Folktales were also a large part of my research, including the tale I found in many cultures about the rabbit in the moon. I first heard this tale from the song “Rabbit in the Moon” by Aztec Two Step. Either the Beginning or the End of the World delves into a horrific family memory carried over generations. The memory is of family members starving to death during Cambodia’s Khmer Rouge genocide. I’ve been on a long journey into Cambodian history and culture to begin to understand what this could mean to a young girl two generations later. The books I read and survivors I interviewed tell a story themselves about my focus. It wasn’t on the wars, but on living after surviving them. I had read widely on wars in Southeast Asia since my early work in Vietnam for the Red Cross. The stories and history of those wars have shaped my interests as a writer. I’ve been a public librarian and literacy program director, working with new Americans to promote family literacy in English. This work has kept me connected to many noncombatants affected by war, like some who had became my friends long ago in Vietnam. In the 1990s I worked at the Cambodian Mutual Assistance Association in Lowell, Massachusetts, teaching the Young Parent Class. My students were teenaged girls from Cambodia who had babies and needed support to continue their high school studies. Most of them had lived in the Khao I Dang camp in Thailand before coming to Lowell. Later, I moved with my family to a small New Hampshire town. New to the school, my daughter Lizzie became friends with a 13-year old girl from Cambodia. Her name was Ty. We became close to Ty. She loved rice and our house began to smell like Basmati rice she and her family ate. (Other Cambodian friends told me no, it is always Jasmine rice Cambodians eat.) I include the memoir Tye wrote as a child in my reference list, My Trip to America. Now my daughter’s grown, but I’ve continued to research Buddhism, Southeast Asian culture, and impacts of war on families. Before I wrote Either the Beginning or the End of the World, I wrote a novel about a girl from South Sudan, The Good Braider. That novel ends in a place in which the young protagonist, Viola, is a determined girl, negotiating her mother’s strict African culture as well as the American one in which she lives. I leave her there, okay for the moment. But I know her journey is just beginning. A key resource to me was a therapist I met, Debra Lastoff, who works with Cambodian people struggling with the impact of the Khmer Rouge genocide decades after their escape from the war. She helped me understand about generational trauma and her work to help people with PTSD see themselves as survivors, to take the experience of the past “out of the dark, put it in the light.” This work of bringing stories out of the dark and into the light is also the work of others I met in Lowell including Chhan Touch at the Metta Health Center and the writer Seng Ty who’s also a guidance counselor at Stoklosa Middle School. Cambodia Folk Stories from the Gatiloke, retold by Muriel Paskin Carrison, from a translations by The Venerable Kong Chhean, Tuttle, 1987. Chigas, George. Chanty’s Garden, Loom Press, 1988. Him, Chanrithy. When Broken Glass Floats: Growing Up Under the Khmer Rouge, Norton, 2001. Rosenblatt, Roger. Children of War, Anchor Books, 1983. Ung, Loung. First They Killed My Father: a Daughter of Cambodia Remembers, Harper Collins, 2000. Yorm, Ty. My Trip to America, Puma Press, 1990. Finkel, David. “The Return: the traumatized veterans of Iraq and Afghanistan,” The New Yorker, Sept 9, 2013. Forche, Carolyn, ed. Against Forgetting: Twentieth-Century Poetry of Witness, Norton, 1993. Gopal, Anand. No Good Men Among the Living, Metropolitan, 2014. Kyle, Chris, American Sniper, Harper, 2013. Nakashima, Rita. Soul Repair: Recovering from Moral Injury After War, Beacon, 2012. Children’s book author and illustrator Anne Sibley O’Brien writes a column, “Connecting Through Story,” for Welcoming America. Here she focuses on the Cambodian American experience in books for children and young adults.